2 Bedroom Terraced House For Sale in Rotherham for Guide Price £130,000. FIRST TIME BUYERS DREAM, viewing is a must to appreciate this two double bedroom, mid townhouse situated in this sought after and popular location and positioned in a cul de sac. 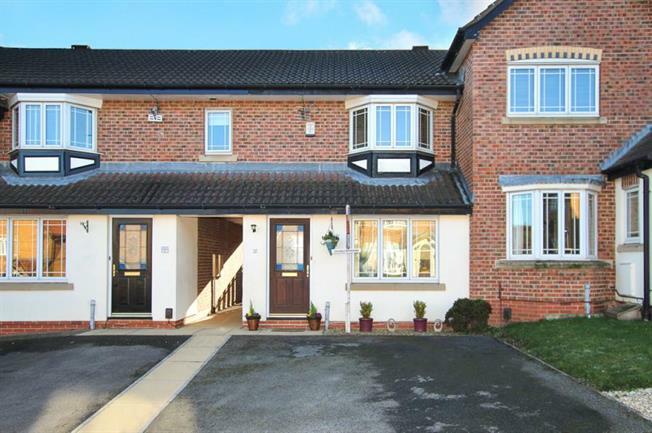 The property gives access to commuter links which include the M1 motorway network and Sheffield Parkway and also give access to local amenities. The property is well decorated and appointed and an internal viewing is a must. In brief the property comprises of front entrance porch with door leading through to the spacious lounge / dining room. The dining area has tiled floor and patio doors leading to the rear garden and from the lounge a spindled staircase rises to the first floor landing. Kitchen having a range of fitted wall and base units in Beech effect including oven, hob and extractor hood. First floor landing having two double bedrooms, master having built in store cupboard and family bathroom with a white three piece suite. Outside to the front is a double drive providing off road parking. There is access to the rear of the property via a side passage where there is an enclosed garden with paved patio, lawn and decked area.